Out puttering in the garden, I started to reach for the hose nozzle. 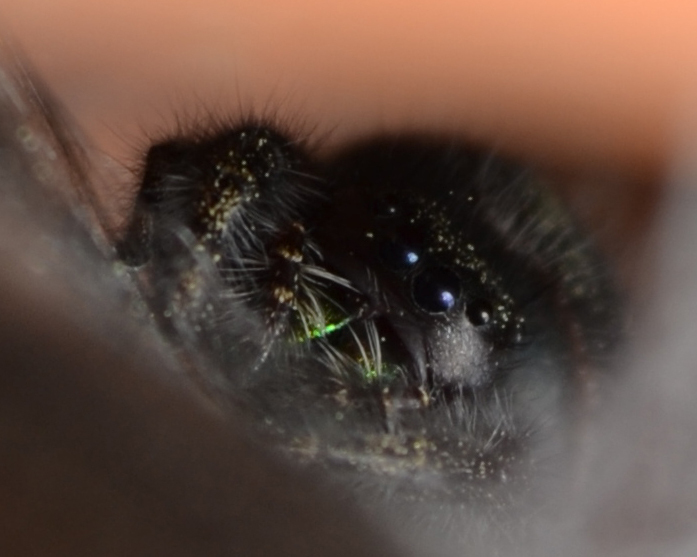 Then I saw this hairy troll right next to it with these shiny black eyes and pulsing, green iridescent …mouth parts? Needless to say, I decided to water later and went to get my camera. Categories: gardens, outdoors, photography, spring, summer | Tags: eyes, gardening, gardens, insects, nature, outdoors, photography, spiders | Permalink. 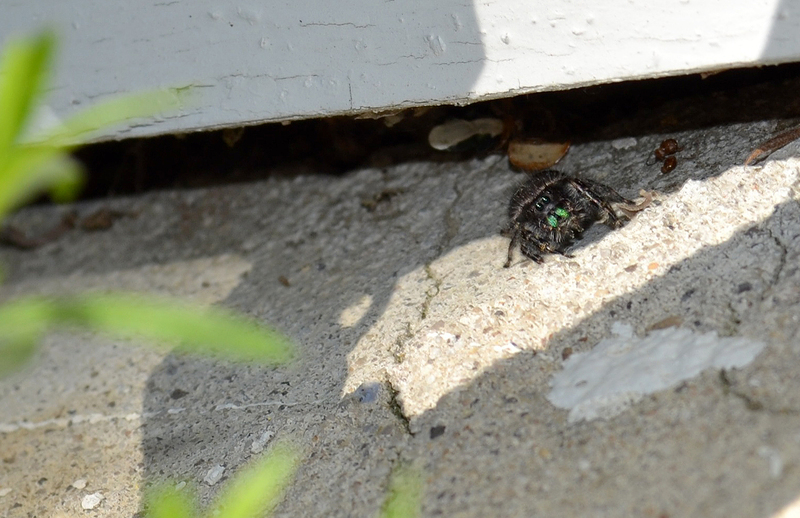 Fixated on spiders as I seem to be this summer, they are also decidedly creeping me out. Everywhere I look I see a fluttering moth or some unfortunate beautiful turquoise damselfly struggling to escape a sticky web. Sometimes I try to save the damselflies. Yesterday, my eye got caught just in time to see a spider lunge, pounce and efficiently dispatch the pretty white moth caught up in her web. Drama on this small scale is still drama. I keep checking the rosemary plant pot saucer, trying to catch a glimpse of the iridescent spider who lives on the front porch, but she’s got two sort of cocoons spun and recently just her shadow is visible in the smaller of them. This is the gal I can’t get out of my mind. I shiver as I imagine these cocoons sheltering dozens of tiny, shiny-eyed predators with iridescent green mandibles. Since I don’t see her much anymore, I have begun to zero in on a spider who keeps adding to a big web in the east corner of the porch. 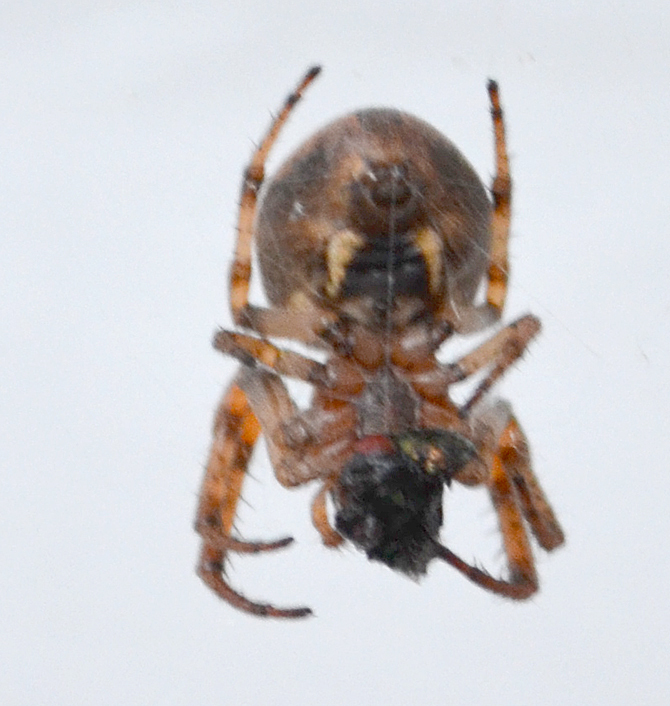 Even though the photo is not crisp, you can see filament jetting from the spinnerets in this shot. It’s a busy web with lots of debris clinging along with dangling mummified insects. I’m sure to be back to that one to watch for gruesome action. Daddy Long Legs don’t freak me out like their shorter-legged cousins. Maybe because I once read that even though they are technically arachnids, they really aren’t the same as spiders: They don’t spin silk and they can’t bite humans. 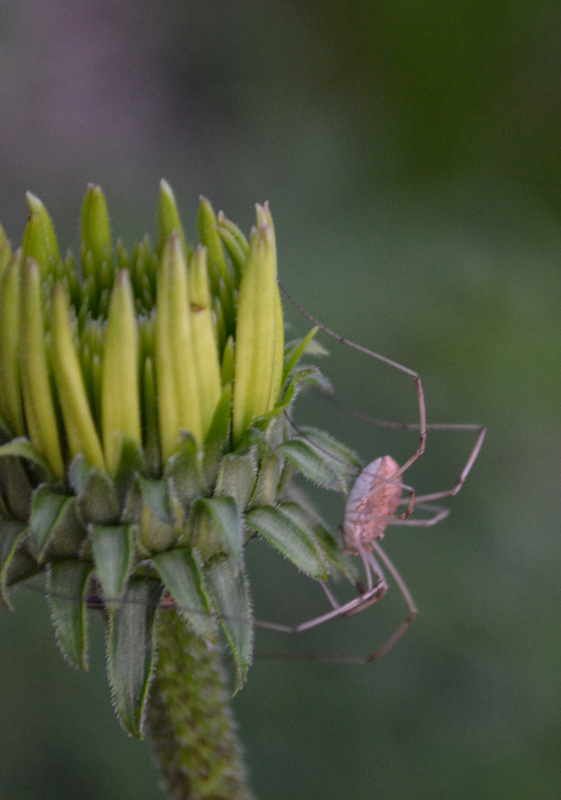 I snapped the small Daddy pictured above while it rested on top of an echinacea flower bud. The proximity of the camera lens startled him, but he posed just long enough for me to focus in on his way down the stalk. Categories: gardens, outdoors, photography, summer, Updates | Tags: disturbing images, gardens, insects, outdoors, photography, spiders, summer, uncomfortable encounters | Permalink. Encouraged by the fact that I did not get stung when I photographed the hornet, I had the courage to get up close to this spider living in the saucer of a potted rosemary plant on my porch. Brilliantly aware of my fascination, she constantly keeps her face toward me, watching me as I watch her moving about her abode. Tomorrow morning, I’ll set up the tripod and see if I can get some full body shots as she scuttles about in the saucer. She seems most active when the sun is not directly warming the terra cotta. I resist the shivery thought that crossed my mind just now: going out at night to watch her work. Brrrr. Categories: gardens, Minutiae, outdoors, photography | Tags: disturbing images, faces, gardens, insects, outdoors, photography, spiders, uncomfortable encounters | Permalink.